1To make the pastry, combine the flours, sugar and salt in a medium bowl. Add the butter and blend it in with a fork, pastry cutter or even your fingers until the mixture is well combined, with pieces of fat the size of a pea remaining. Add the water and stir just until the dough comes together. Shape it into a disc and let it rest for at least 20 minutes, or refrigerate for longer. 2When you're ready to make the galette(s), preheat the oven to 375F. Cut the thick neck off the butternut squash, peel it with a sharp paring knife and cut it in half lengthwise. Slice each piece into 1/4-inch thick slices. Place in a glass (or microwave-safe) bowl, drizzle and toss with oil, cover with plastic wrap or a lid and microwave for 3-4 minutes, until the squash is tender. 3Meanwhile, set a skillet over medium-high heat. Add a drizzle of oil and a dab of butter and saute the onion for 4-5 minutes, or until turning golden. Pull the leaves off the thyme or rosemary and add them to the pan (if it's rosemary, finely chop them first) and season with salt and pepper. 4If you like, divide the pastry in half or quarters. On a lightly floured surface, roll each piece into a circle about 1/4-inch thick. Transfer to a parchment-lined baking sheet. 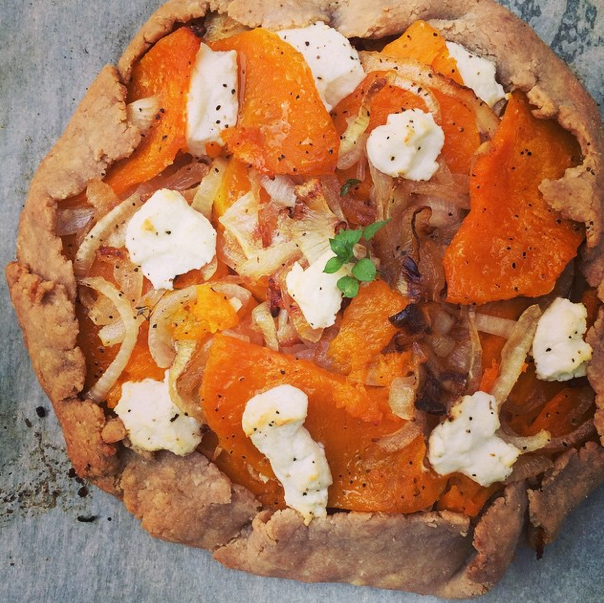 Layer the squash and caramelized onions in the middle of the pastry, adding dabs of goat cheese too. Leave at least half an inch uncovered around the filling, and fold up the edges to enclose the squash, crimping them a bit wherever it naturally folds in order to keep it in place. Bake for 20-30 minutes (for smaller galettes or a larger one), or until golden. 5Slide out onto a cutting board and cut into wedges.